The MMCI Summer Convention was held in Lathrop, Missouri June 14-17, 2018. I was there resting for a minute and noticed the cutest little boy run by wearing a bright gold MM shirt and an MM hat. It brought back memories so fast of my boys who loved the tractor shows in our area and how proud they were wearing their MM shirts and hats. I began wondering if the parents of these little ones knew the opportunities open to their children because of the MM collector in their families. Thirty-seven or so years ago my husband, Michael, became interested in antique tractors. He wanted something different than the green and red tractors that are common with collectors in our area. His Uncle had an old 1949 UTU that he decided to purchase and restore. He restored that first tractor and then restored a 1940 UTU with factory dual wheels next. 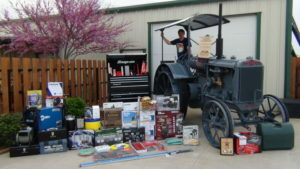 He sold those first two tractors and began his third restoration right about the time our boys were beginning sports, scouts and 4-H programs. This third tractor sat in the shop minus wheels, in buckets, and the parts were scattered on and under a saggy table for years. It moved to our new house in buckets, boxes and sat in the corner of the new shop. In the summer of 2008, our third son, Benjamin, told us he wanted to put the tractor together. While his dad was excited, I was not. I knew that Benjamin had little time, it would cost a lot of money, and I didn’t know if he would or could finish the tractor. Benjamin, a high school sophomore, researched and found information on the FFA and 4-H programs that has contests in Tractor Restoration. The questions were endless about costs, where to find parts, what kind of paints, and what is needed to qualify for these contests. As parents we had to step back and ask if this project was worth the time and the money. Benjamin read everything he could get his hands on from tractor magazines, internet, and anyone that would talk to him about the tractor. As the paint was drying they were loading the tractor on the trailer heading to the Houston Livestock Show with his restored 1952 Minneapolis Moline ZASI Military Tractor. He received his first blue ribbon and was talking on the way home about his next restoration project. 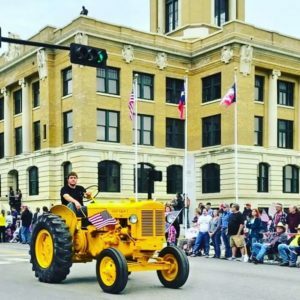 Benjamin was invited to drive his 1952 ZASI Military tractor he had restored in the Metal of Honor Parade in Gainesville, Texas. 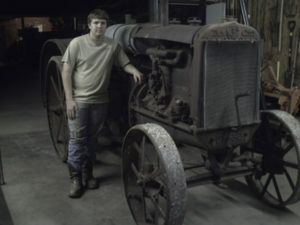 Benjamin’s second tractor restoration was a 1937 ZTU on steel wheels. He expanded his contests to include the Texas State Fair, San Antonio Livestock Show, and other smaller shows around Texas. He received numerous prizes with the top one this second year being a $12,000 scholarship. Needless to say, his senior year goal was much higher. 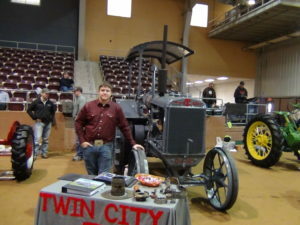 He then restored a 1929 Twin City 21-32, complete with a canopy, and was awarded the Grand Champion at the Houston Livestock Show. The 1929 Twin City before Ben restored. Hard work resulted in many prizes and a scholarship. I have to admit the tractor restoration projects have been and continue to be an amazing adventure for our entire family. Without a doubt, I would say that the money, time, and lessons learned by all were priceless. In 2008, when this adventure began we didn’t have a clue as to the true value of these restorations would bring to Benjamin and our family. The scholarships and the prizes were numerous and provided a solid financial foundation for Benjamin’s education. He attended Lincoln College of Technology in Grand Prairie and graduated Master Mechanic in Auto and Diesel Mechanics. But the actual “gold” in this story is the lessons learned from these restoration projects. I think Benjamin’s biggest lesson was in time management and to expect the unexpected and have patience when it comes to these old tractors or any project. He learned the importance of keeping accurate records using photos, videos, receipts, and documenting hours spend on the projects. He learned how to compile information into a record book documenting the complete restoration. He learned how to research a tractor using the internet, books, old magazines, tractor manuals, and by talking to collectors around the country (for hours) on the phone. He learned how to communicate with judges in interviews and how to organize, write speeches and give presentations. He learned the importance of a clean and organized shop and about safety while working with shop equipment. But, the biggest lesson of all is that he learned he can do anything he sets his mind to and that he can do it well. Our family as a whole also shares in the “gold.” We have so many wonderful memories of the time spent in the shop with Benjamin as he worked on his tractors. 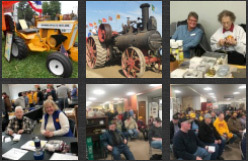 We have researched and found through relatives and pictures that there is a history of Minneapolis Moline tractors in our family. Our genealogy records not only have records of births/marriages/deaths, but of a Minneapolis 17-30B Cross Engine that plowed in the field where we live today. There were many friendships formed from fellow MM collectors all over the United States who answered questions, supported him, shared information, and guided him through this process. He will remember and value their friendships forever. Benjamin appreciated and values them so much that he is passing on the gifts he received by mentoring in our area with others restoration projects. Last year he helped a local young man here in our shop and they completed a 1938 MTA with factory dual wheels. Now, he has just begun a new adventure with Simon who is Benjamin’s first cousin. They plan to restore a 1940 RTU for the future Texas Livestock Shows. A grant specific to restoration is the MM Collectors Club Preservation Grant. FFA has a tractor restoration program that goes to the national level with scholarships. 4-H has programs in this area also. Here, in Texas, many our Livestock Shows hold contests with the Fort Worth Show picking up this contest in the last couple of years. Texas State Fairs have contests in this area. There are scholarships that change every year so check out companies such as Snap-On or Mac Tools. Good Luck to you and your adventure! May the Minneapolis Moline friendships continue to grow, and the love of MM treasure hunting never end!